Who knew there was a day to celebrate the beautiful haiku? In any case, we thought we would try our hands at a few work-related haiku poems and encourage you to do the same. According to the dictionary, a haiku is a Japanese poem of seventeen syllables - in three lines of five, seven, and five, traditionally evoking images of the natural world. 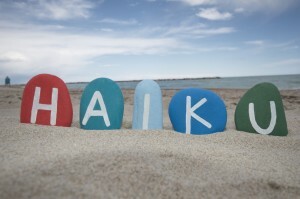 We hope you enjoy our efforts and that our poems inspire you try creating haiku of your own! The true sign of spring. Muffled laughs and icy glares. Page One can fix that. Yes, you need a blog. Don't question me, It's a fact. Now pay me to write. But your blog ain't one. Fulfilling work, dogs, and more! Barking and running all day.